John Crooks (Project Lead) escorts me into the recording room in John Powell’s Studio in Los Angeles where the California String Quartet are warming up for an upcoming session. It’s an interesting room - a huge amount of glass in the windows looking into the room and what seems like a limited amount of acoustic treatment, especially for the standards of a room of its size. Crooks flips open his laptop to reveal an elegant Max 7-style interface of some kind, and clicks a couple of buttons. The sound of the entire room goes dead in an instant. I look over at the California String Quartet, and they seem just as surprised as I am. Either we’ve all been simultaneously teleported somewhere, or something interesting is going on. 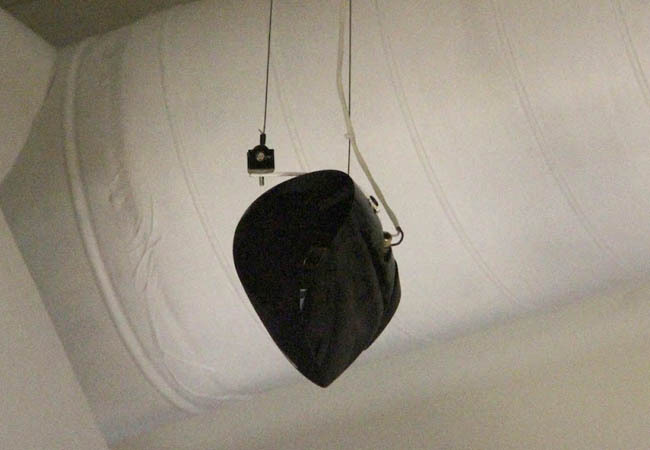 It turns out that that Max patch on Crooks’ laptop is controlling a speaker array positioned under the ceiling that lets him control room ambiance in real time. His custom application lets him improve the room, defeat feedback or sound massing problems, and provide everything from subtle extensions of the room’s natural reverb to turning the space into a house of mirrors. Several years back, John Powell - best known for his scores for The Bourne Identity, X-man, Ice Age and How to Train Your Dragon - had his engineer Scott Wride install a 16in/16out microphone and speaker array in the ceiling of the main studio recording room as a way of enhancing the room ambience and reverberation while recording by feeding live sound back into the room in real time. 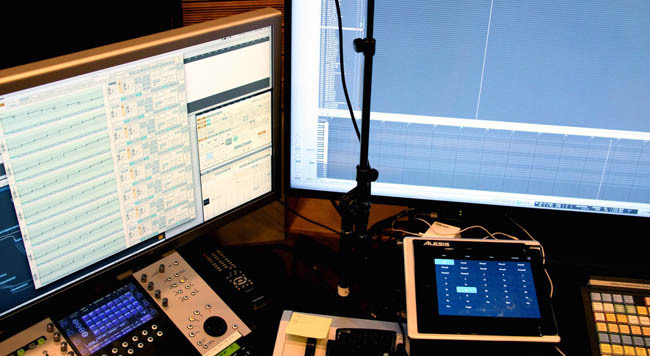 At the time, they also tried to implement a whole system control solution using DAW software available at the time, but to no avail. One of Sixteen: Here’s a close-up of one of the 16 speaker/microphone pairs that comprise the array - the small microphone is positioned just above the speaker. John Crooks barely noticed that stuff on the ceiling when he first arrived at the studio - not really until September of 2013, when the subject came up in the course of a meeting. 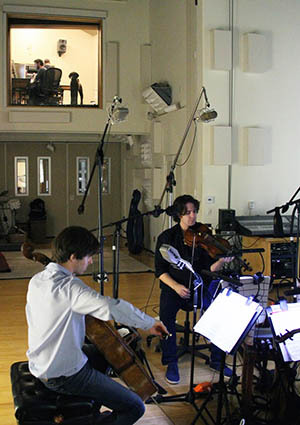 In the course of a number of conversations that followed with Powell and studio engineer John Traunwieser, the three of developed a basic idea of the sonic goals of the array, and Crooks began implementing the ideas using Max. The initial preparations included research and measurement: combining the scientific literature for paper on active acoustics and researching the sonic reflectivity of actual physical room materials and the acoustic properties of reverberation. Using that research and the measurements, studio staffer Michael Matthews and Crooks developed an algorithm that gave them gain and decay time coefficients for the entire 16x16 microphone and speaker array. Discussion between John Powell and the California String Quartet prior to beginning the session. 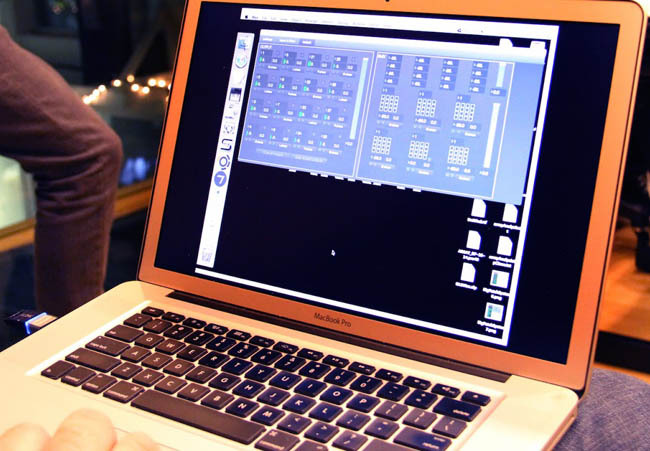 Armed with this information about the array, Crooks tested their algorithms by creating some Max patches used digital reverbs within Max to process the incoming audio. After ironing out the math errors in their algorithms by testing and trial, Michael created a 5-pole audio input filter and tested various solutions. He eventually arrived at a matrix-based solution that used sets of 32-plane 16x16 Jitter data matrices to store and morph the gain and delay coefficients for the speaker array. The matrices can be remapped, which greatly increases the range of reverberation behaviors the system can create. 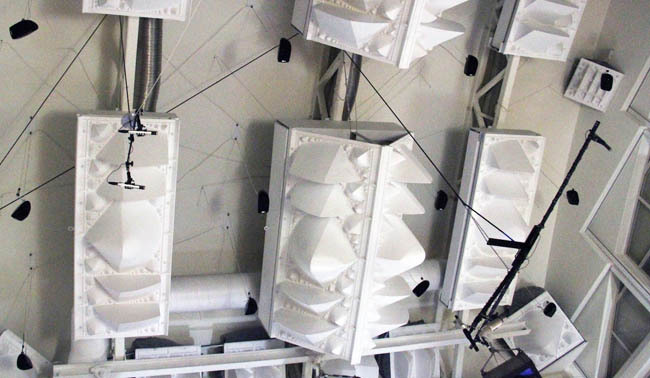 In addition a collection of user-adjustable algorithms that alter the overall dynamics and delay behavior results in a really flexible active acoustic solution. In addition to a variety of random processes that improve sound and help defeat feedback, system includes LFO-style Jitter Matrix mixer that can produce an extremely wide variety of sonic results from subtle to extreme. 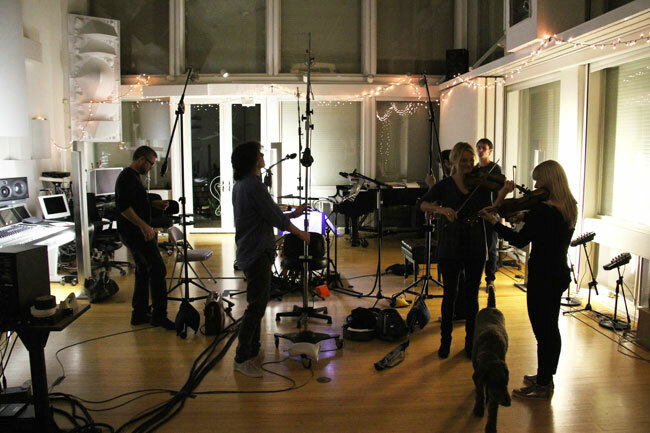 John Powell began using the live array in his recordings for projects starting in October of 2013. 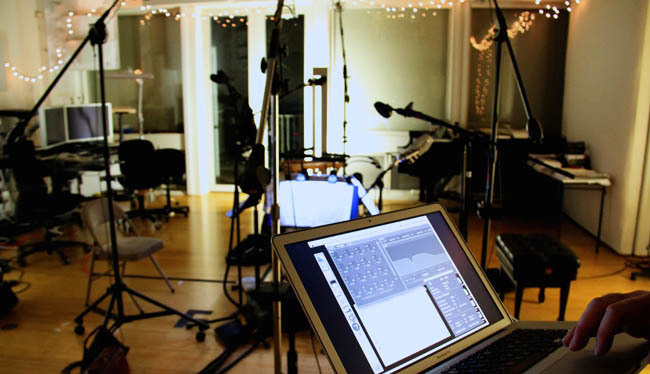 Meanwhile, back in the real recording studio world of the present day, Crooks has “turned the room back on,” and he monitors the 16x16 Array in real-time keeping an eye out for peaks whilst the Quartet runs through final paces. 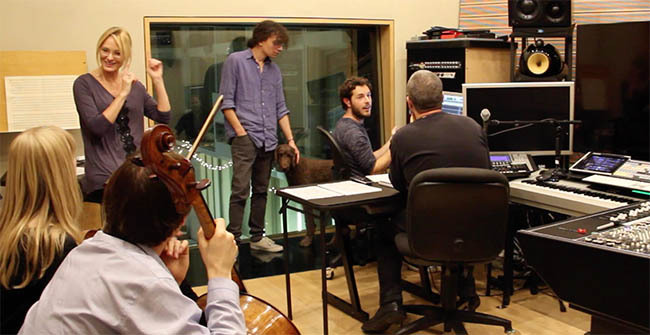 As he listens, he’s able to modify the room acoustics in real time. Of course, we have to take a closer look at the Max patch – it’s why we’re here. The critical part of the solution lies in the fact that the application’s top-level patches each run in separate audio threads in both Max 6 and Max 7; each input and output stage of the array and the patch that bounces the 16x16 output into a 5.1 mix is loaded independently as a top-level patcher by the master controller. That design decision allows them to run the array at a vector size as low as 128 samples without overloading the CPU on a Mac Pro. It looks good. It sounds amazing. John Crooks completed a MFA in the MA/PhD program in Integrated Composition, Improvisation, and Technology (ICIT) at The University of California, Irvine. 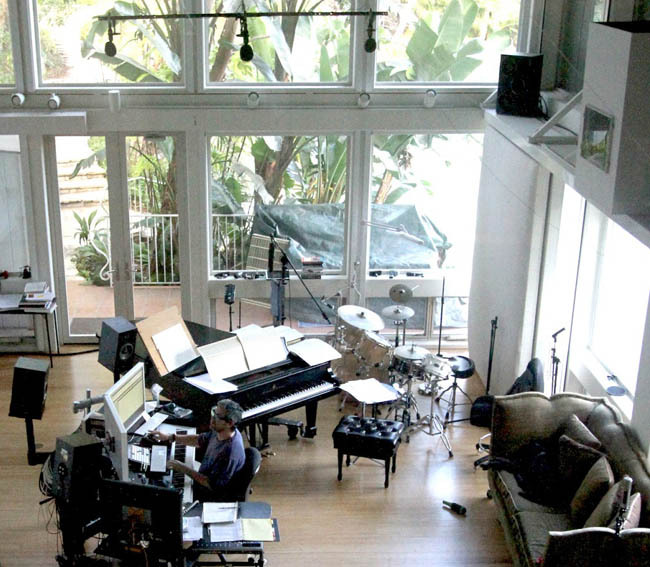 John Powell (seated in his studio) is an English composer, best known for his scores to motion pictures. 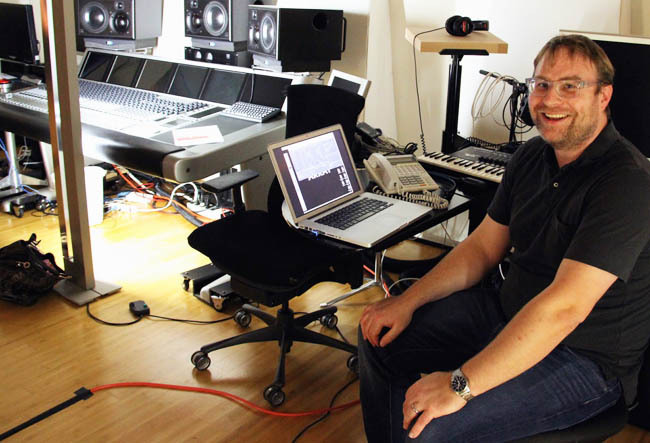 He has been based in Los Angeles since 1997 and has composed the scores to over fifty feature films. He is particularly known for his scores for animated films, including Antz, Chicken Run, Shrek (all three co-composed with Harry Gregson-Williams), Robots, Happy Feet (and its sequel), three Ice Age films, How to Train Your Dragon, for which he was nominated for an Academy Award, and its 2014 sequel. Who else can find a dog in 4 of the 11 pictures here? Can anyone find more? Beth, third pic is the best overall dog picture. What about the other three--and are there more?? He's in the foreground of pic1, in the upstairs window of pic3, being patted by the guy in the purple shirt in pic 6, and lying on the couch in pic 11. Is he part of the sound proofing? RSCUDDER, Yes that's all the dogs I found too. JHNO check out the work of Agostino Di Scipio, particularly his installation "Modes of Interference". I think it will be right up your ally. what happens if you use an impulse response of your ears to process the room sound?